I wrote slumber-party strips early on and was delighted by the opportunity to work an actual slumber party into the strip. Also, Dave looks very cute in his shirt and tie. This is one that got written early on and then sat around waiting for a storyline. No time is the wrong time for Dave getting his nails painted! Please note that the official lab pajamas, first mentioned in the Very Long Fanfic of Jeffrey Wells, are adorable. Dave is forced to choose “dare” because there are certain truths he really, really doesn’t want to reveal in front of a mixed group. Especially not a mixed group that includes a wickedly grinning Mell. I’m sorry for not including a strip where Dave actually kisses Caliban on the lips. People were confused by this strip when it first ran. All I meant was that Helen plans to use the mint-flavored gender-swap formula to turn Dave into a woman so he can sing Girl Scout campfire songs with her. Is that really so hard to understand? I was in a pretty thoroughly horrible and half-assed Girl Scout troop as a kid, but I did get an education in most, if not all, of the standard girly campfire songs. So there’s that. I like Dave’s pensive expression in the first panel, where he’s just waiting politely for this whole silly business to be over so they can get back to fighting demons. I love this strip. I should have won ten Nobel Prizes for it. TEN. As the blueprint in the third panel indicates, Madblood is working on his new top-secret base, which will appear in a much, much later storyline. Also, I’m really bad at drawing phones. The ubiquitous Narbonics Labs couch is based on the couch in the house I shared with three people in college, back when I first started writing Narbonic. For the record, it’s blue. Helen is the only character in Narbonic who would ever refer to anyone as “all tuckered out.” I always loved writing her dialogue. At this point they know each other so well that Dave can argue that he doesn’t even need to say it. Obviously Helen has been unsuccessfully trying to make this happen for some time now. 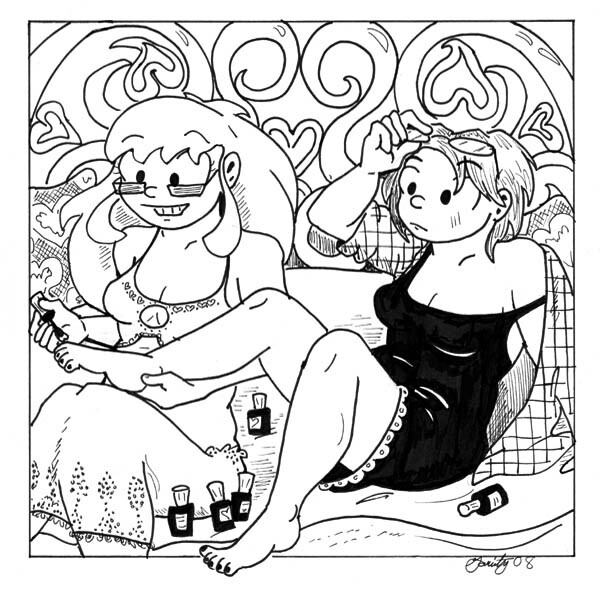 Putting a bona-fide Valentine’s Day slumber party in a storyline entitled “Demons” is one of those cute juxtapositions that I like about this webcomic. I was so proud that Shaenon canonized the lab pajamas. Mell! Go fetch the pajamas! And gossip and chat and gab! “Mell! Go fetch the pajamas! Aw, pouty Helen (panel 3) is cute. No wonder Dave crumbled. I meant to ask earlier, but forgot: is there a color picture of Helen in That Dress anywhere? I could swear that I saw one back when the strip was first running, but I haven’t seen it show up in any of the Sunday strips so far. The quivering lip of Helen Narbon. More devastating than anything in Storage Room C.
This panel exemplifies for me the melding of sweet little girl and evil mad scientist that is a big part of what makes Helen so utterly captivating and adorable. @Ed: That was awesome. As a reward, you get to name another muscle for Konstantin. @Rob Vines: Dunno about official, Shaenon-drawn stuff, but I did include the Dress in my paper doll revamp/expansion sets. Dave succumbing to his innermost nail-painting urges seem to be a recurring fantasy of yours. Strangely, I haven’t really thought of Labyrinth as a Muppet movie until just now, even in spite of its broad Muppet cast. I guess I’ve just always thought of it as an eerie fantasy firstmost – possibly due to first watching it in close proximity with MirrorMask. Mr. Pibb?? What are you trying to do, ATTRACT the Legions of Hell? That stuff’s pure evil in a 2-liter bottle. To repel demons, obviously, you need to drink Heaven-Up. @Ed: I’m with you on the Heaven-Up, but I think for attracting the Legions of Hell you’d want something like Moxie. @andy4hire: When I was a kid, my dad did the accounting for the local RC bottler. He must have done a heck of a job on the numbers, since the owner of the factory dropped off a few cases of RC and Nehi Orange and Grape every couple of weeks for a year after that. No wonder we were always running around like crazed madmen…. That’s probably where I saw it, then. Thanks! @samhdaniel: “Crazed madmen”? That’s even worse than regular madmen! Nothing personal, of course, but even though I envy you the RC and Nehi I’m sort of glad I wasn’t your parents…. Are the lab pajamas pink-and-white, blue-and-white, or both? Maybe this is why Dave’s nail looked painted way back when he had to push the weather controller button. Slumber party in our lair! Mell and Helen just don’t care! Gotta kiss a former demon! While we fiddle with our makeup, nails, and hair! Truth or dare! Truth or dare! Truth or dare! Hey Leon, did you get the fourth wall breakage yesterday? Those pajamas really are adorable. Bad move, Dave. No matter how embarrassing and/or potentially life-threatening the truth, Mell can come up with a more embarrassing and/or life-threatening dare. Thank you for not including a strip where Dave actually kisses Caliban on the lips. Ohhh! Every time I read this strip, my brain silently altered that to “a box of thin mints.” I figured Dave was just falling to girl scout-related bribery. Ohhh! Every time I’ve read this strip, I thought the mints were for kissing Caliban, as mentioned in the previous strip. I always thought it was obvious that Helen meant to use the mints to turn Dave female. I always thought Helen was talking about Thin Mints myself, until I read Shaenon’s commentary. Thank you, Captain Continuity! The doctor made a clone! From teen to fully grown! And then her Master’s, too! The clone, she took it bad! And now she’s fully MAD! And I’m back. Damn illness. I’d always presumed that Helen was asking Mell to fetch the mint flavoured formula which swaps the gender of the person eating it for the sole purpose of turning Dave into a girl so he’d sing along to girl scout songs. Makes perfect sense. Oh, and I’m considering putting “Dave” as my preferred name on my British Army application forms. It’ll just be easier in the long run. It had been long enough since the last gender-swap arc that I didn’t remember the formula tasted minty, so this one did indeed lose me. Oh man, I never got that Dave was supposed to be a girl again in this strip! Silly me. I guess I couldn’t tell from the hair this time when he was on the side of the panel. Because of this strip I started consistently using the phrase “male type person.” Your influence on my life is both kinda boring and yet incredibly profound. @jenfullmoon: It’s not a failure of your perception. Dave’s not a girl here. Helen just threatened to turn him back into a girl to nullify the reason he gave for not joining her and Mell in the sing-along. He knew his defeat was inevitable, so he joined in as a male-type person rather than going through the transformation to a female-type person and having to join in anyway. Now THIS is real slumber party action! Prank phone calls to guys! but that’s a great drawing of an electroshockpincherwrench! and what’s with the oboe in panel three? This episode speaks for itself, but I still want to say that “It’s after 10:30!” is the best part. Ah, prank calls. Expenssive and annoying. Unless you reverse the charges. Then they’re only annoying. Any strip that features Lupin’s mom, even off-camera = win. Edwin, there’s a special forum for that. Light, medium, or dark blue? For someone sleeping for the first time, Caliban sure chooses to sleep in an awkward pose. Well, he’s new to this and isn’t sure what the non-awkward ones are. No, my feet are adorable. Come on, those are hilarious feet. Feet are hard. They’re almost as complex as hands, and they deform in strange ways under load. And it’s trickier to use your own as models.